I tend to be quite loyal to L’Oreal when it comes to colouring my hair as I know I can trust the results, that it doesn’t dry it out and it doesn’t irritate my skin. Last month I used my trusted Preference (in 6.45 Brooklyn Bohemian Auburn) to add a little warmth to my locks, however, I found that it wasn’t quite as vibrant as I was looking for and decided to have another go. I found the new Prodigy range online last week and was instantly drawn to it due the lack of ammonia (the smelly chemical in most hair colourants) in the formula. I chose 6.45 Amber as I didn’t want to go quite as vibrant as the 7.40 Vermillion and picked up a box from Boots the next day. Before setting to work on my colour, I used a specialist hair razor to remove damaged ends, add texture and re-shape, giving the colour the best possible canvass to work on. The mixing process was so simple and effective, unlike other colourants that I have used in the past where you put the mixtures in a bottle and shake, after squeezing the contents of the colour and developer into a bottle you use a spatula to mix and give it a little shake to finish. After leaving for 30 minutes you rinse as normal and condition. I’m not very tidy with my application but found this came off of the skin with ease with a face wipe and that it didn’t take ages to rinse out of my hair either. As you can see from the images, the difference was fantastic. My hair looked glossy, healthy and naturally warm in tone, I loved it. There was no chemically smell left on my hair and I was able to comfortable sit and wait through the development time without having to open a window. L’Oreal claim that Prodigy’s oil based formula will give a natural, multi tonal appearance to the hair, improve texture and shine and the product hasn’t disappointed. I am massively impressed with the results and will definitely stay loyal to L’Oreal thanks to this little beauty as it is more than worth it’s £6.49 price tag. 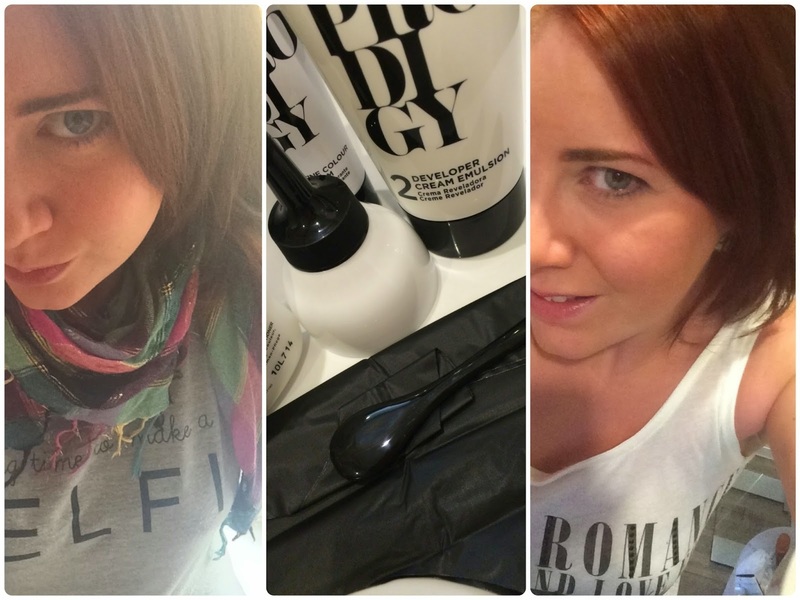 Do you home colour and treat your hair? What do you use and why? Pop over to the Harmony Blaze Facebook page for a chat!